Perfect for child safety, raise as well as tilt the mini blinds without cords! Because there is no dangling cords, these pull down blinds are an excellent option for motor homes trailers and rvs. Each cordless blind is made from durable 6 gauge aluminum slats and a matching contoured metal headrail. Operate these cordless mini blinds by simply adjusting the bottom rail of the blinds. W: 18" 19" 20" 21" 22" 23" 24" 25" 26" 27" 28" 29" 30" 31" 32" 33" 34" 35" 36" 37" 38" 39" 40" 41" 42" 43" 44" 45" 46" 47" 48" 49" 50" 51" 52" 53" 54" 55" 56" 57" 58" 59" 60" 61" 62" 63" 64" 65" 66" 67" 68" 69" 70" 71" 72" 0/0"1/8"1/4"3/8"1/2"5/8"3/4"7/8" H: 18" 19" 20" 21" 22" 23" 24" 25" 26" 27" 28" 29" 30" 31" 32" 33" 34" 35" 36" 37" 38" 39" 40" 41" 42" 43" 44" 45" 46" 47" 48" 49" 50" 51" 52" 53" 54" 55" 56" 57" 58" 59" 60" 61" 62" 63" 64" 65" 66" 67" 68" 69" 70" 71" 72" 0/0"1/8"1/4"3/8"1/2"5/8"3/4"7/8"
Do the cordless mini blinds have something to adjust the tilt of the slats? Yes. 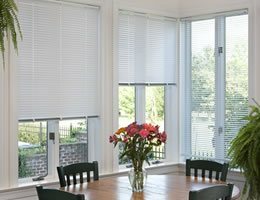 The cordless mini blinds can be both raised and lowered as well as the blind slats tilted without dangling cords. To raise and lower the mini blinds simply lift or pull down on the blinds using the bottom rail. To tilt the mini blinds just twist the bottom rail either towards the front or the back and the blind slats will tilt in that direction. The quality of the blinds is what I expected, having stated that I am disappointed in the cordless feature. The quality of the blinds is what I expected, having stated that I am disappointed in the cordless feature. This feature my work on a smaller window but doesn’t work on the large windows, difficult to adjust also awkward to raise and lower. It sounds like a good idea although I would not recommend the cordless feature. Stick with the cords you won’t be disappointed. This is my second order from Blinds Chalet and I could not be more pleased. This is my second order from Blinds Chalet and I could not be more pleased. These blinds are excellent quality at a great price. I inquired with customer service about obtaining extra bottom handles and received them in the mail within a week. Purchased and installed both 1" Cordless Mini Blinds and Elite Cordless 1" Mini Blind. Purchased and installed both 1" Cordless Mini Blinds and Elite Cordless 1" Mini Blind. The 1" Cordless Mini Blinds feel lighter than the Elite Cordless 1" Mini Blinds. Their string holes are large and blind leaves do not close tightly; result is sunlight leaks through string holes and between blind leaves. The 1" Cordless Mini Blinds are fine for living room but not recommended for bedrooms. For bedroom, the Elite Cordless 1" Mini Blind is preferred. Love them! Very happy with the cordless wandless feature!